"THIS CONGREGATION SHALL BE KNOWN AS TEMPLE SHALOM ..."
We have no definite record when the first Jews came to Colorado. In the mid 1870's, a large community already existed in Leadville and smaller settlements in Denver, Cotopaxi, Silverton and other mining camps. The record of the first Jew in Colorado Springs is a matter of conjecture. The first individual of whom we have definite knowledge is a Louis Ehrich of New York who arrived in 1882. He was a philanthropist of note, having presented to the Typographical Union the large tract of land on which now stands the Union Printers Home. An official census of 1892 lists two families, three widows, ten children, and five bachelors. The first religious service was held in the year 1895, someone's memorial service. That year High Holy Day services were observed locally in private homes and conducted by one of the worshippers. Later, various lodge halls were rented and Cantors engaged. In 1900, when a Torah was purchased, 21 names were listed as contributors. The year 1902 saw the establishment of the Hebrew Benevolent Association, the first Jewish organization in the community. A few years later, another charitable organization was started, the Hebrew Free Loan Society, making loans without interest or security. On August 31, 1902, the first meeting of the Sons of Israel Association was held. There were 21 members and the dues were set at ten cents per month, later to be raised to fifty cents. The first major project of the Association was the creation of a cemetery, the Sons of Israel Cemetery in 1903. During this period, the Reform population was in the majority. They were to have the first Sunday school, about 1908, and the first Rabbi in 1912. About 1908, a third congregation arose, strictly orthodox, which proceeded to build its own house of worship in 1909, a tiny structure located at 404 S. Conejos. This congregation continued to function until 1935, when its surviving members merged with the Sons of Israel. Soon, the Jewish population increased to some 150 people, and the Order of Bï¿½nai Brith and Council of Jewish Women came into being. From a religious standpoint, the community was divided and the building of religious structures had to be abandoned. However, in July 1911, the Sons of Israel Association purchased the building of the United Brethren Church at 417 S. Cascade and Colorado Springs had a synagogue. Some fifty years ago, ten families gathered and decided something must be done toward the organization of a liberal congregation. Out of that meeting came Congregation Beth El. A constitution was adopted, officers elected and charged with the responsibility of finding suitable quarters, and making necessary arrangements for regular Sabbath and High Holy Day services. The first meeting place, "All Souls Unitarian Church," was their home for several years. Later the Congregation moved to the library of the First Congregational Church. For the first two years, Sabbath services were conducted by members of the congregation. For the High Holy Days, the Congregation managed each year to obtain the services of men who were versed in the ethics and ritual of Reform Judaism. A meeting was again called and after a short discussion it was decided that, regardless of the heavy financial burden, a Rabbi should be engaged. Karl Weiner became their spiritual leader and Rabbi. The Congregation then directed its energies toward acquiring its own home. Their efforts were finally consummated in the erection of the Temple edifice, dedicated on May 8, 1949. The lack of unity and the division of the community made it impossible to maintain a Rabbi for any length of time. Approximately 1938, a partially united community secured the services of Rabbi Pearlman followed by several others. Because this attempt was unsuccessful, the Reform group withdrew, eventually to build its own Temple. The Sons of Israel emerged as Bnai Israel Congregation which secured Rabbi Joseph Goldman in 1947 and built their synagogue which was dedicated in 1951. Both of the existing congregations continued to alternately flourish and struggle for the next ten years. Both succeeded in retiring their mortgages. This was no small accomplishment because at the same time the community as a whole also supported a Bnai Brith Chapter, Hadassah, Council of Jewish Women Chapters, United Jewish Appeal, Israel Bonds, and Jewish Welfare Board activities. During this time, it should also be noted, the Sons of Israel Cemetery was greatly expanded and improved. The active Jewish community at that time fluctuated between 100 and 125 families. Religious education for the children and youth in the community, and the financial considerations, caused the two congregations to explore the feasibility of a combined congregation. Towards this goal they proceeded to hire a shared Rabbi in 1960. The religious school became a combined venture. Services were held alternately in each of the existing buildings each Friday night. High Holy Day services were held in both Temple Beth El and Bnai Israel Synagogue. Each congregation retained its own set of officers and board, and each Sisterhood functioned independently. After two years it was expected that this would culminate in a unified congregation, however the logistics of this system proved to be too complicated. There was not sufficient interaction of the two entities and after the two years the trial balloon burst. Nonetheless, this experience taught all that a combined congregation cannot function under two roofs. The community now had an idea of what they shared and what divided them. Most importantly, the religious school continued to operate jointly for the next ten years. Temple Beth El devised a plan for sharing rabbinic services with the Reform congregation of Pueblo. Bnai Israel spent a number of years without the services of a rabbi altogether and conducted lay services. Cooperation between the two congregations continued on many levels during this period and finally a merger took place. What is stated here in a few words, took hours and hours of thought, planning and discussion. Spearheading this drive were Mr. Sam Cofman and Dr. Fred Sondermann. Many others were involved and several committees worked simultaneously resolving many issues. From this effort the constitution under which Temple Shalom operates was born and a new congregation was formed. Certain safeguards were incorporated so that members of both congregations, as well as those who might join in future years, would be assured that their choice of worship would be protected, i.e., Reform Friday night services and Conservative Sabbath morning services. Not quite 100 members joined Temple Shalom at the very start. A Rabbi was hired in the next few months. The first president of the congregation was Fred Sondermann and the congregation was affiliated with both the Union of American Hebrew Congregations (now know as the Union of Reform Judiasm) as well as the United Synagogue of Conservative Judaism. At the same time a new Sisterhood was organized and by-laws for it were adopted. The year was 1972. Over the next four years prayer books were adopted and the congregation grew to 150 families. From the very beginning of Temple Shalom, it was realized that neither building was suitable or sufficient for the growing needs. There were, from the very onset, continuing efforts and plans to solve this problem and a number of alternatives were considered so the community could have one large house of worship. The needs of the religious school were especially poorly met.. 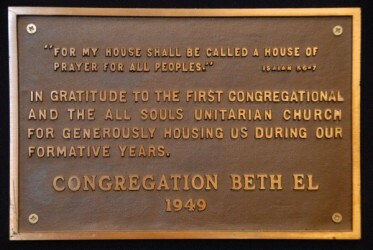 In 1974, the congregation voted to sell Temple Beth El, which had been leased out for one year. In 1975, plans were made for the use of Peterson Field Chapel during the High Holy Days. Proceeds from this sale were earmarked and added to the capital improvement fund which had been established with funds that Bnai Israel Synagogue had brought to the merger. These combined monies were the "start up funds" for the new addition to the current building dedicated in 1980. Since then, many alterations and upgrades have occurred. More families have joined in the unity of Temple Shalom. In the more than 40 years since Temple Shalom's founding, the organization has continue to grow and thrive, serving the diverse and unique population of Colorado Springs and surrounding areas. If you are not currently a member, we invite you to join Temple Shalom and help us write the next chapters in our history. 1860 - Isaac Cahn, wife & family arrives from Westhofen, France. Soon owns & develops Cahn's Addition, land north of Colorado Ave. in Colorado City. 1864 - Isaac Myer owns major hotel in Colorado City. 1870s - Jews active in the Pikes Peak area as major real estate developers, hotelier, stagecoach operation, city trustee, county sheriff & cattle rancher in Colorado City. 1876 - Charlie Myer sells land between Pikes Peak & Tejon east to Santa Fe Depot to William Palmer. 1885 - New York-born Louis R. Ehrich moves to Colorado Springs. Helps found Manitou Springs & Falcon. Serves on many Boards. Convinces Typographical Union to locate Union Printers Home here; donates land to establish it. 1900 - Twenty-one people purchase Sefer Torah & organize Orthodox Kehilla of Colorado Springs, the first Jewish congregation in the city. Local community establishes Hebrew Benevolent Association, Hebrew Ladies Aid Society, Jewish Welfare Board, B'nai Brith. 1903 - Sons of Israel Association organizes to establish the Sons of Israel Cemetery. 1904 - More theologically liberal community members form Temple Beth El. 1907 - National Council of Jewish Women organizes local chapter. Programs include study groups, sewing circles, choir, clothes for Denver Sheltering Home for Jewish Children, English classes, support for immigrant familiies, and running community soup kitchen. Plus sponsor, finance & supervise Jewish Community religious school. 1909 - Sons of Abraham builds synagogue at 404 S. Conejos, on Fountain Creek, serving many new immigrants fleeing pogroms in Eastern Europe. 1911 - Sons of Israel purchases building at 417 S. Cascade. The congregation is initially Orthodox; later Conservative. Temple Beth El hires first Rabbi & starts first religious school; uses Unitarian Church, then Congregational Church for services. 1914 - Sons of Abraham moves to 111 S. Conejos, under the Colorado Ave. viaduct, after first building flooded. Building includes a mikveh. 1931 - Henry Sachs with Morris Esmiol and Ben Wendelken, incorporates the non-profit Sachs Foundation to provide scholarships to African-American residents of Colorado. 1935 - After flooding makes Sons of Abraham building unusable, merger with Sons of Israel creates B'nai Israel at 417 S. Cascade. 1940s - Jewish community with USO organizes a kosher kitchen in the downtown area for Camp Carson soldiers. Hadassah Chapter formed. 1945 - Temple Beth El affiliates with Reform movement. 1949 - Temple Beth El builds at 1702 Pikes Peak Ave. Anti-Defamation League, Jewish National Fund, United Jewish Appeal are active. An Israel Bonds Committee forms. 1951 - B'nai Israel builds at 1523 E. Monument St.
1950s - Temple Beth El and B'nai Israel joins active congregations of Fort Carson soldiers and Air Force Academy cadets to support four Rabbis in the community working together. As the two sisterhoods & Hadassah become more active, the local National Council of Jewish Women Chapter dissolves. Later, each congregation remains too small to support a Rabbi, and there is regular turnover. Differences in religious philosophy continue to split the community. Other differences, such as whether to support the new State of Israel, reflect similar differences in the American Jewish community. 1960 - Temple Beth El and B'nai Israel jointly hire Rabbi Robert Bergman to serve the "United Jewish Community of Colorado Springs." He starts a joint religious school. 1962 - First serious, but unsuccessful, merger efforts fails. Joint reglgious school continues. Both Temple Beth El and B'nai Israel continue to struggle financially. 1971 - Temple Beth El and B'nai Israel merge to become Temple Shalom under the leadership of Dr. Fred Sondermann, Sam Cofman, and many others. 1980 - Temple Shalom adds new sanctuary, classrooms. David Bram & Michael Berman lead the work. 2003 - Temple Shalom purchases Union St. Building and holds rligious school classes there. 2006 - Lack of remodeling funds leads to sale of Union St. building. 2008 - Temple Shalom upgrades classrooms, sanctuary. 2011 - Temple Shalom celebrates its 40th anniversary and the community-at-large celebrates its 110th. 2017 - Rabbi Jay Sherwood becomes Rabbi of Temple Shalom. 2018 - Construction of Beit Shalom cemetery and expansion of Sons of Israel cemetery begins. Also during the year, the Board of Directors approves the formation of The Temple Shalom Foundation. 2021 - Temple Shalom will celebrate its 50th anniversary! We hope you will join us! Stay tuned for more information. *A special thanks to Dr. Perry Bach for acting as historian of Temple Shalom and the local Jewish community.